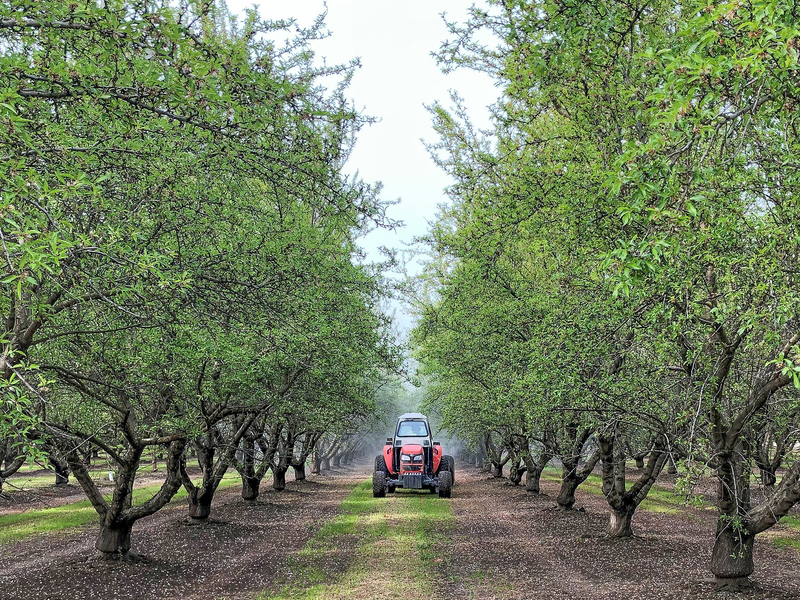 Orchards continue to turn green as leaves emerge while the last vestiges of bloom disappear. Tiny nutlets have begun to emerge from their protective jackets and the first major shed of excess nutlets is around the corner. There is now significant size variation in all varieties throughout the state. 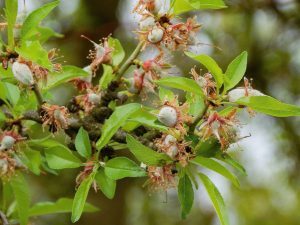 It will take a few more weeks to be able to fully identify what nutlets will stay on the tree and which will get dropped off. 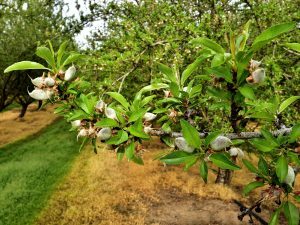 As time progresses, growers are beginning to make observations about their crop. Piazza’s observations follow what the bud set looked like in the Hughson/Denair area of Stanislaus County. 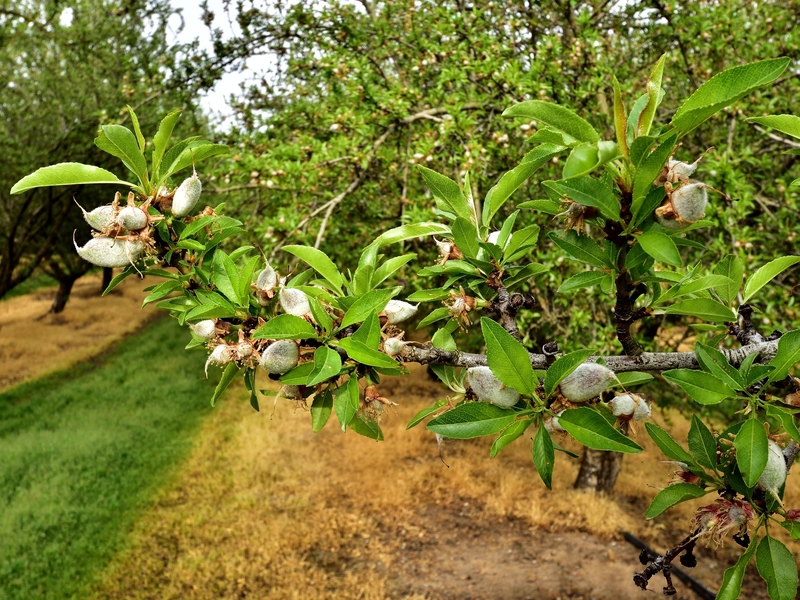 The earlier blooming varieties did not have as strong of a bud set as the later blooming cultivars, though it appears to be better than what the bloom weather would have indicated. Later blooming varieties, Butte and Padre in particular, had a heavier bud set than a year ago. Bloom timing between different varieties within each orchard paralleled very well. In most cases bloom timing didn’t vary by more than a day or two, providing good chances for flowers to get pollinated when bees were able to fly. 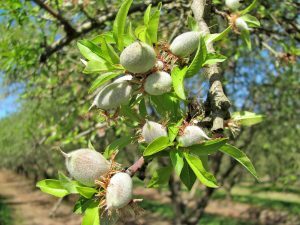 Though Piazza’s comments reflect well on what his area is experiencing, opinions on the crop vary widely throughout the state, as bud sets and bloom hours varied. 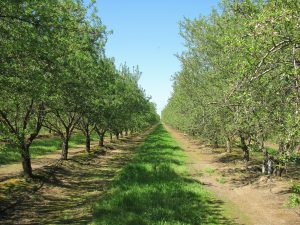 It will still take a few weeks to have a realistic idea of crop potential in California. Sunshine and warm temperatures spurred nutlet and leaf development last week. Daytime highs in the 70s and calm, clear skies have assisted in nutlet development. Rain on Wednesday night and Saturday morning in certain areas did little to stop progression. With drier weather growers were able to catch up on all their disease treatments prior to the storms. 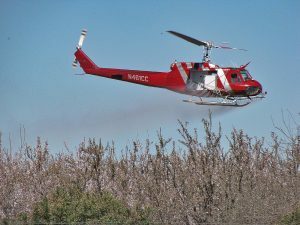 Bee keepers are removing hives from fields and moving on to their next stops. As leaves continue to develop, growers are beginning to apply fertilizers to assist in crop development. Our next scheduled crop update is Monday, April 29. In the event of any significant occurrences prior to that date, this site will be updated as soon as possible.